Kid’s can easily explore their passion for film at the New York Film Academy’s 2-Week Filmmaking Camp. Our programs give students a chance to work hands-on with industry-standard cameras and equipment. 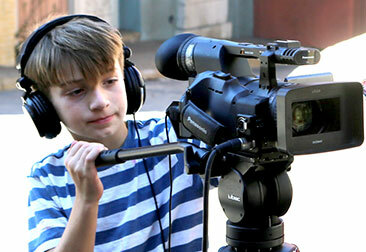 The camp offers a great opportunity for students to dip their toe into the world of filmmaking. No experience is required, only enthusiasm! Our two-week camps challenge kids to bring a story to life with moving images. From the first day, students work hands-on with digital cameras and learn how to compose, direct, light and edit for quality images. While students will serve as writers and directors on their own projects, they will also build practical set experience by serving as assistant directors, actors, gaffers, and cameramen in their fellow student’s productions. Many kid’s cite the variety of their experiences and the chance to work with high-end equipment as the most enjoyable parts of the camp. In the first week, campers create a short silent film to be celebrated at the end of the camp in a screening open to cast, crew, friends, and family. Then, in the second week, students build upon their knowledge in the second week to create a second film of greater complexity, to be viewed at their end of camp screening. New York City campers may use iconic downtown Manhattan and Battery Park as backdrops for their supervised projects. Los Angeles campers will shoot their productions on the Universal Studios backlot. South Beach, Miami, campers can expect a vibrant, sun-dappled background for their original productions. set and costume design, locations, shot choices, and coverage. The finished product is a film of up to five minutes. Classes focus on genre and style in topics including digital cinematography, screenwriting, editing practice and aesthetics, and directing for cinema.